Well, firstly, dysfunction means “not working properly”. This is a general term which refers to any number of problems (irritation, compression, misalignment, laxity etc.) which can cause a joint not to function as well as it should. 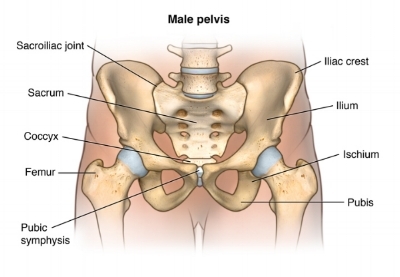 The sacroiliac joint (SIJ) is an L-shaped joint between the sacrum, which is a wedge-shaped bone at the base of the spine (ending in the coccyx) and the larger, wing-shaped bones of the pelvis (which incorporate the hip joint). The term sacroiliac joint (SIJ) dysfunction most often refers to excess compression of the joint (usually as a result of local muscle spasm creating uneven forces over the joint) which causes the joint to become painful. Pain from the SIJ can present as low back pain, buttock pain or sciatica. In some cases, there is no pain in the area at all, but an injury occurs elsewhere as a result of altered biomechanics (for example, a hamstring strain on the side of dysfunction). For a long time, it was thought that the SIJ was fused and therefore did not move; as a result, SIJ pain is still often assumed to be referred from the lower spine. However, research has shown that this joint does have a small amount of movement and can most certainly give rise to pain. Physiotherapists who have undergone specialised training in this area are able to identify and treat a number of different types of SIJ dysfunction. Milkwood Health are specialists in this area - we could be your answer!